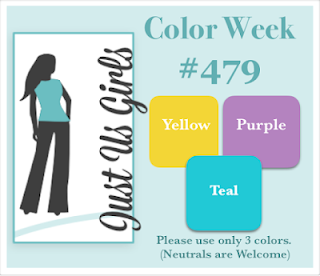 Nancy is our host for this week's Color Challenge at Just Us Girls and these are the colors she has chosen. They say "Spring" to me so that's the direction I went with my card. I was inspired by Tanja Kabel who made a card using the Gerda Steiner bunny peeking across a triangle in the corner of the card. I saved it to Pinterest but can't find the original post to link it. I placed my bunny on a piece of purple patterned paper, added the teal and placed the GS duckling peeking out from the other side. I used PolyChromos to color my critters and a black glaze pen to give them shiny eyes. I hope these colors inspire you to make a card for the challenge. Check out what the Design Team and our Guest Designer Greta have done if you need some inspiration. What a sweet and fun Easter card, Bobby! Love these little critters peeking out and the pretty papers! Arne't they a cute little pair! This is sweet Bobby! OMGosh this is so cute! I love those critters peaking around the corner. So sweet! Absolutely adorable! I love the bunny and chick peeking out from behind the patterned pieces. Great use of these colors. Cute as Bobby and love your take on this weeks colours. Simply adorable! Such a unique & happy card, Bobby--love it! Such a cute card bobby! That duck's face is adorable, you just want to squeeze him he's so cute.